Welcome back to our Sunday Blog Hop where we hope to inspire you for Mothers Day - and we have been inspired by our Annual Catalogue or our Occasions Catalogue this week. 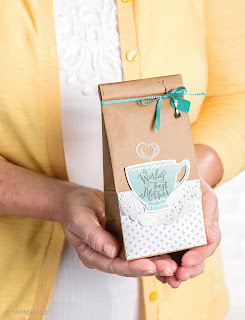 I've flipped through both catalogues, and in the end, I really loved this little gift bag from the Occasions Catalogue in the Have a Cuppa Suite on page 34. I converted the cute lil bag into a card, but basically the project is the same this week!! The DSP comes from the lovely Love Blossoms Paper Pack, and my colours are Crumb Cake, Bermuda Bay and a touch of Pool Party for the tea cup. I stamped those tiny hearts with some White Craft Ink, and used vellum for the heart die cut . I've sent off two of these cards to my Mum and Mum-In-Law along with their little gifts. Both of these lovely ladies do enjoy a cup of tea!! 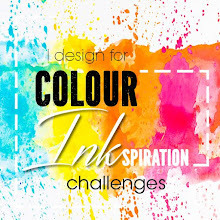 I hope you've been inspired, and that you will have a go and join in our challenge this month!! Simply use this link to add in your project post from your blog!! And now it's time for you to continue hopping around the blog hop and see all of the amazing projects from the whole design team... and enjoy!! 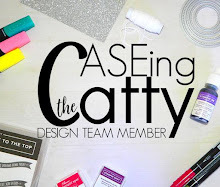 For a complete list of all the design team members and their posts, you can head on over to our Sunday Blog post for Caseing the Catty. Cute idea to change the bag to cards. I'm sure the mothers will love them. What a pretty card. Love the colour combo. I think the thing about this challenge that I love the most is taking a 3D project and using it to inspire a card or vise versa. Love your transformation this week. I love your CASE especially the choice of colours and that gorgeous DSP. Your mum and MIL will love your handiwork. CTC#74 - Shine On inspiration!! Weekly Deals - only while they last!! CTC#73 - Botanical Gardens inspiration! !